Come falcon watching at the Sagrada Família, Barcelona this Sunday 18th May. Plaça Sagrada Família with Thalassia, Galanthus and Iberianature. 10:00-13:00. 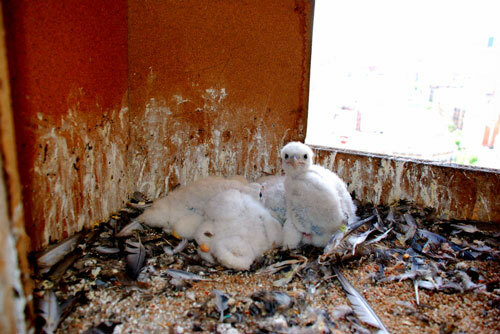 Eduard Durany, of the Barcelona Peregrine Falcon Reintroduction Project, a scheme close to my heart, has sent me this photo of chicks in Guadi’s Sagrada Famila. Eduard notes that this year four chicks have hatched in the nestbox, a record for the site. In 2005, 2 chicks were hatched, in 2006, there were another 2, and in 2007 just 1 females. The father was released in Barcelona port in 2001 and the female was born on the Montjuïc cliffs in 2006. Photos here another BCN pair. + More info on Barna’s peregrines. Thalassia and Galanthus are also organising a Peregrine Watching Day on 10th May from the Plaça del Sagrada Família, which is right in front of the nest. Telescopes will be available. I’m going. The activity starts at 10:00am.